OUR PRICE: $79.95 - Join Rewards Get $7 Dance Dollars On This Item! 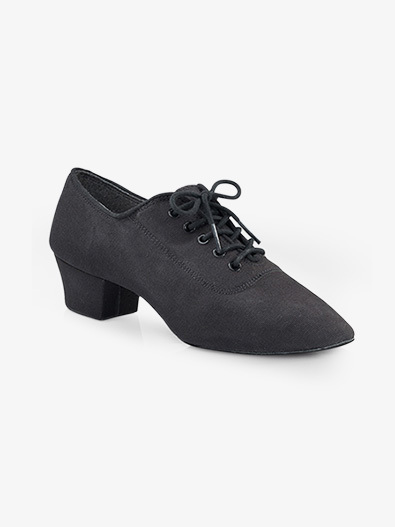 This unisex practice ballroom shoe features a classic Oxford style canvas upper, a 1.25" canvas wrapped Cuban heel, absorbent cotton lining, a 3/4 flexible shank, a beveled cushioned insole and a suede sole. Great for men and women! Suggested Fitting: Women order same as street. Men order 2 sizes larger. Narrow feet should subtract 0.5 size. The shoe is unisex. Women should order their street size and men should order two sizes larger. Narrow feet should subtract 0.5 size. Please view the sizing tab for more information.